What Exactly is a Murphy Bed and How Does it Work? 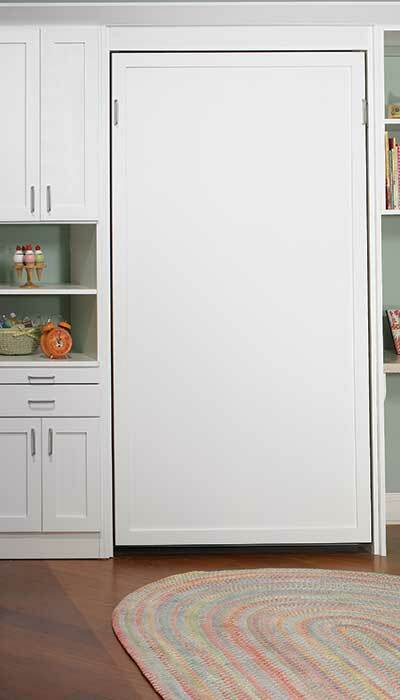 A Murphy Bed is a hidden bed that is stored in an upright position within a cabinet or closet. The cabinet can be a simple box, closet, or a more elaborate wall unit system that is usually anchored in some way to the wall. The backside of the bed is covered by a panel to match the cabinet or wall, rendering it's function invisible to the casual observer when closed. The bed is opened by pulling on a handle attached to the top of the panel, lowering it into a horizontal position for use. Legs fold down on one side of the bed for support. The other side remains attached to the cabinet. 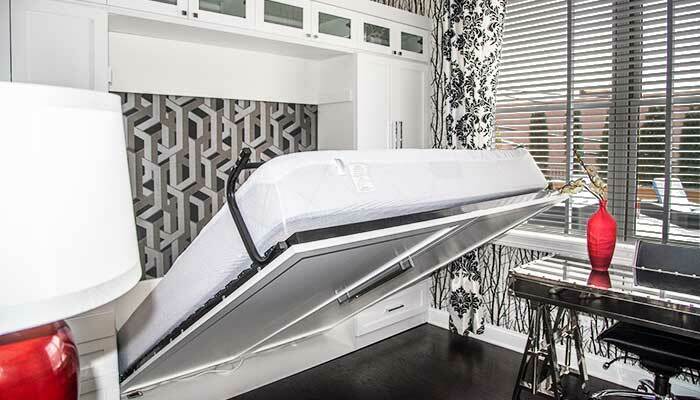 A Murphy bed in operation. Murphy beds are often chosen for tight spaces and rooms that need to do double duty as both a home office and occasional guest room for overnight visitors. The term "Murphy Bed" is named for William Lawrence Murphy, the bed's inventor who patented the innovative design during the early 1900's. His pivot and counterbalance system gave hidden fold down beds dependability and ease of operation. He founded the Murphy Bed Co. to manufacture his beds, which is still in operation today. However, in 1989 the United States Courts ruled that the term "Murphy Bed" had entered common usage so thoroughly that it was no longer eligible for trademark protection. There are now many manufacturers who make a similar high-quality product. The generic term for all of these beds is "wall bed" because of the way they fold out of the wall. The term Murphy bed (sometimes spelled Murphey bed) specifically refers to a bed made by the Murphy bed Company, but many people now refer to all wall beds as Murphy beds. 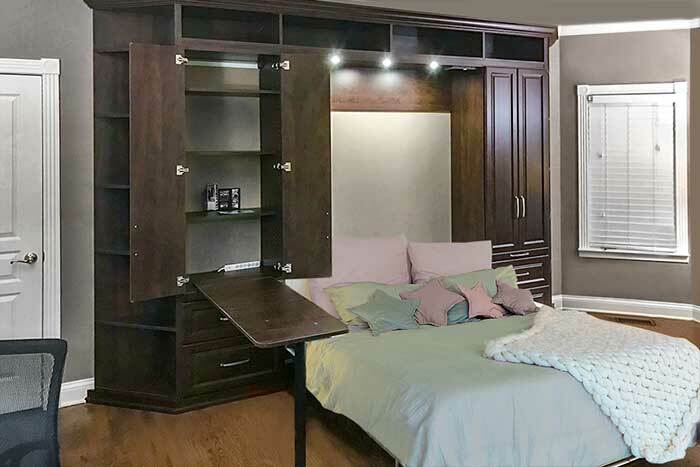 A Murphy bed system can be divided into two main components — the mechanics and the cabinetry. Mechanics refer to the actual bed parts that go up and down, while the cabinetry refers to the box and wall unit that surround the mechanics of the bed. The cabinetry for a Murphy bed can become quite elaborate and is often the deciding factor in a consumers' decision to select one particular bed over another. Although the mechanics all of these beds by different manufacturers share similar characteristics, there are different ways to make a Murphy bed. The original Murphy Bed used springs as the system to control the raising and lowering of the bed. This old, reliable method is still in use by many wall bed manufacturers today. However, the problem with this is that, like your overhead garage door, the large springs that raise and lower the bed will eventually snap. This can present a safety hazard if someone is in the bed — or even the room — when this happens. An alternate way to raise and lower the bed is with pistons containing compressed air. They work similar to the pistons that raise and lower the trunk on a hatchback car. The compressed air method is reliable and safer than springs. It is preferred by many companies that install these bed systems, including Closet Works. Also considered to be part of the Murphy Bed mechanics is the actual bed support system. Most Murphy beds use a European slat system on a flat frame to support the mattress and ensure the user gets a good night's sleep. The wooden slats are all bowed slightly to create a springy surface to hold the mattress. A well-made slat system will work just as well as a traditional box spring to support the mattress and ensure a comfortable night's sleep. For most people, the cabinetry is the pièce-de-résistance of any Murphy bed system. Inexpensive wall beds may come with a simple box-like cabinet to hold the bed, but elaborate wall systems are usually custom pieces of built-in furniture. A Murphy bed system should be bolted to the wall for stability and free-standing units are not recommended. The bed mechanism is attached to the cabinetry or box with sturdy screws, and the custom cabinetry that surrounds and holds the bed is then secured to the studs, creating a very sound and safe sleep system. Cabinetry may be as simple or elaborate as the user desires, with some storage systems for Murphy beds wrapping around multiple walls with built in desks, credenzas, book cases and more. Most popular among the wall bed cabinet features are pull-out side tables, built-in lighting, and cabinets on either side of the bed to hold blankets and pillows. 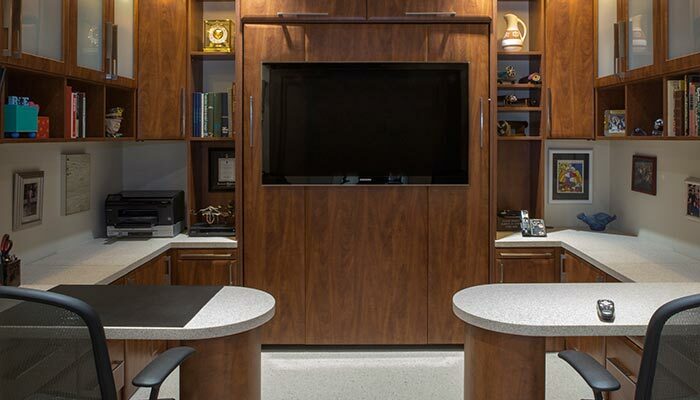 Since many Murphy beds are installed in rooms intended to double as a work space during the day, complete home office organization systems are a common feature in your more elaborate Murphy bed wall units. 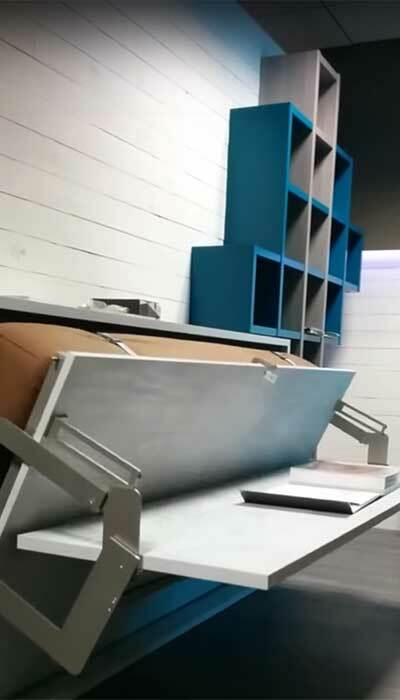 Hidden desks are another must have feature for many consumers. Since rooms with Murphy beds often function as both home office and guest room, homeowners like the ability to fold the desk away when the bed is out. There are different ways to hide the desk. The desk can be attached onto the front panel of the bed like a big shelf when it is closed and become part of the legs that support the bed when it is open. It can also be hidden inside a cabinet next to the bed. Another option is to integrate a desk into the wall unit surround as a kind of pull-out desk/table unit. 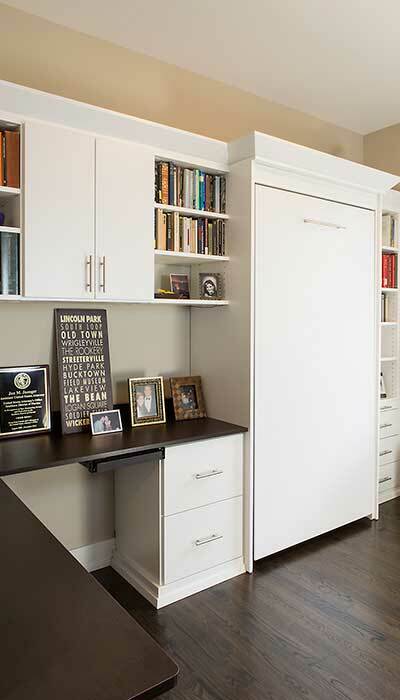 There are different ways to include a hidden desk in a Murphy bed system. These examples include the desk mounted to the front panel of the bed when closed. When the bed is down, the desk is under the bed. Another open is to include a fold down desk in a cabinet next to the bed. This type of desk functions most similar to an actual Murphy bed. 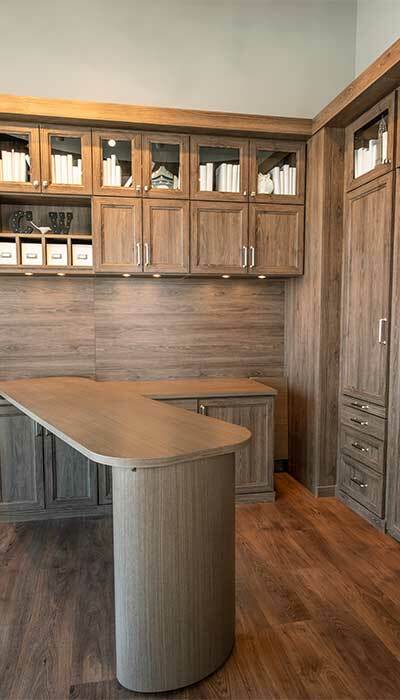 The final example shows a slide away desk that tucks into the credenza next to the Murphy bed. It can be slid out when needed. Other options, such as bookshelves, printer cabinets, entertainment centers, and even sofas can be incorporated into a Murphy bed solution through the use of custom cabinetry. Some Murphy beds will even have a television set mounted to the front panel of the system so that the space can be used as a kind of den or TV room when the bed is closed. Murphy bed in home office with television mounted to front panel. The TV stays in position when the bed is opened and remains attached to the panel on the underside of the bed. Murphy beds come in twin, full and queen sizes. The cabinet and panel needed to mount a king size bed would be so large and heavy that it is recommended to use two smaller beds in a room if you need that much sleeping space. Manufactures usually don't make the king size, however, queen wall beds are the most popular choice among Murphy bed users. Full size is also highly favored among wall bed owners. Twin size beds are less common but are a nice choice for a child's room or when space is limited. Murphy beds come in vertical or horizontal fold out styles. That means that the bed folds out of the cabinet either foot first or side first. 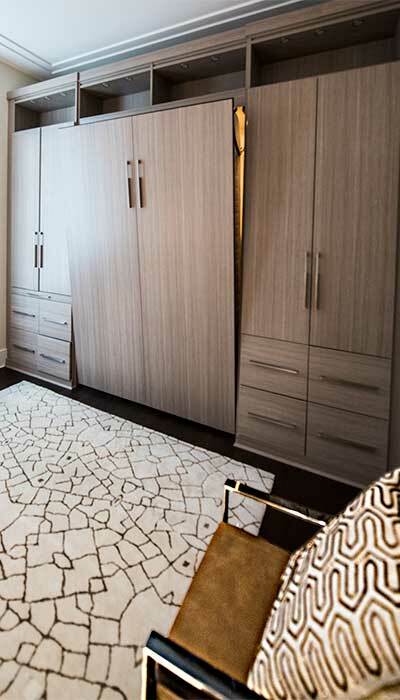 This is because Murphy bed solutions are often driven by space saving considerations. The type of bed needed can change depending on the dimensions of the space and position of the bed in the room. Murphy beds come with either horizontal or vertical pull-down mechanism. The one that is best for you will depend on the size and use of your room. No matter which size or type of Murphy bed you select, there are numerous accessory options to choose from. Built in desks, sofas and bookcases that attach to the front panel are popular choices. 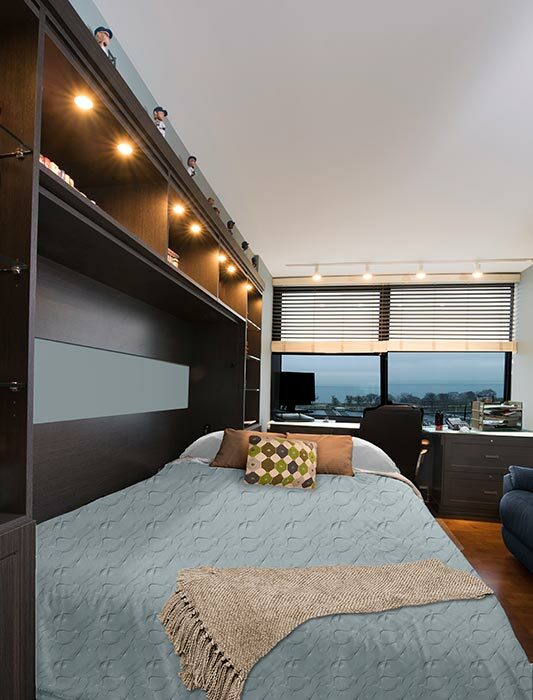 Although it is something that no one trying to sleep on it can do without, the mattress is often considered an accessory to the Murphy bed system. Wall beds will accept mattresses that are anywhere from 6"-10" thick, depending of the manufacturer of the bed. This makes them a little thicker than your usual sofa bed mattress. Weight of the mattress is also a consideration, therefore, Tempurpedic or heavy foam mattresses are never recommended. 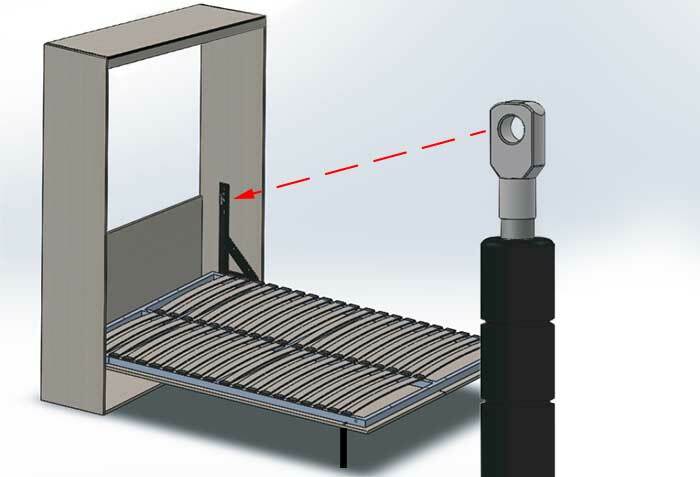 Although sturdy under normal conditions, the slat support system used on these beds does have weight constraints. You want to have enough weight allowance left over after installing the mattress to allow for the occupants of the bed. 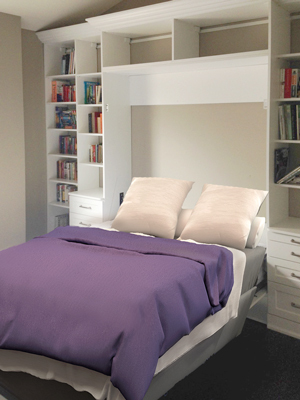 Mattresses that will fit a Murphy bed are available from all the major mattress manufacturers at various price points. They can be purchased from most mattress stores, although it may not be an in-stock item and could require a special order. 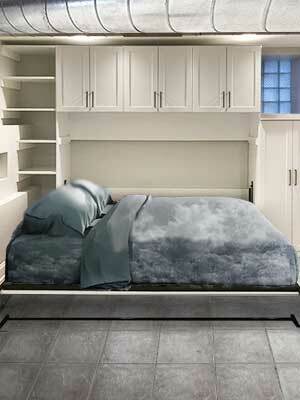 Murphy beds are a wonderful solution for small rooms and tight spaces. They are also a good choice when you need a room to do double duty. They come in three sizes — twin, full and queen, plus two configurations — vertical or horizontal. A high-quality wall bed system will give many years of service whether you plan to use it on a daily basis or just need to accommodate occasional overnight guests. Be aware of safety issues when choosing any kind of wall bed. Remember to look for a unit that uses pistons rather than springs to raise and lower the bed. The slats that support the mattress should be slightly bowed towards the mattress. They need to be springy with some give in order to provide a comfortable night's sleep. You definitely don't want a bed that feels like you're sleeping on a rock. 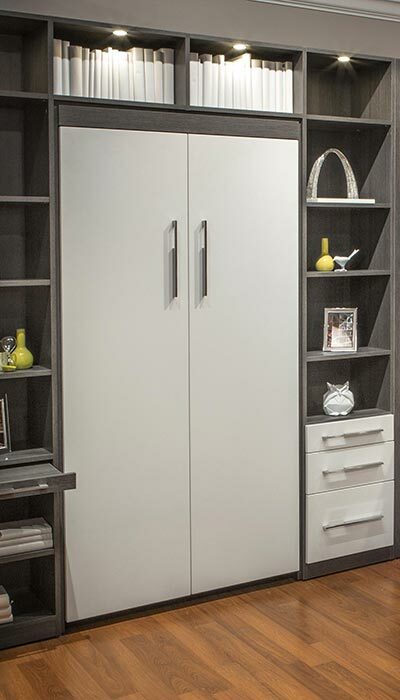 Cabinetry is up to the user and the sky's the limit when it comes to designing your custom Murphy bed surround. Accessories such as hiddden desks, slide-out tables, sofas and bookshelves and televisions that attach to the front panel and disappear when the bed is opened are all possible when you become the owner of a Murphy bed. Receive these tips monthly in your email! Closet Works is Chicagoland's largest and most experienced provider of custom storage solutions. 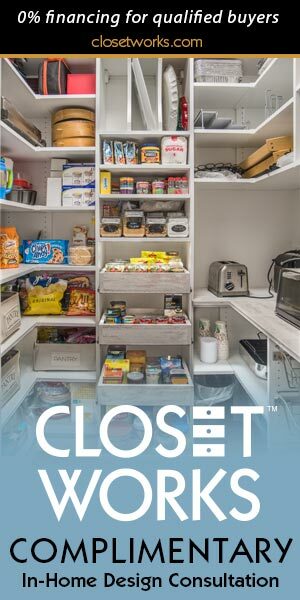 Since 1987, we have been helping homeowners by creating closets, pantries, laundry rooms, office/guest rooms, wall units and more that help create a better, less stressful lifestyle. All of our organization systems are made locally at our factory in Elmhurst IL. USA. Great ideas to "Organize Your Life" and examples of our products can be found throughout our website. For more information on Closet Works call toll-free at 800-4-CLOSET (800-425-6738).